Far down in the valley lies Shey gompa. Tomorrow we will follow the stream eastwards. Almost hidden in the red cliffs lies Tsakhang monastery, home of the young Tulku. Gorge from Shey to Samling, unfortunately we did not have enough to go so far north. Shey Gompa becomes the centre of Upper Dolpo during a festival in June. It is the starting point for the kora around Crystal mountain. 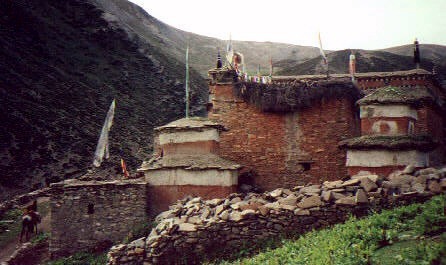 Shey gompa, built on a plateau above the rivers. The first pass after Shey, we leave Inner Dolpo already and turn south again in order to reach Do Tarap. The view towards Tibet and Mustang, barren hills are followed by high mountains. Strong wind blows dark clouds over the ridge. I wake up early in the morning after a night of relatively good sleep – considering the altitude. When I look out of the tent to make sure that the sound on our tent is only a quick shower I am surprised. Sleet is falling, the whole valley is filled with thick clouds. The ground is not covered yet, but it is not pleasant to walk with snow and cold wind hitting your face. The trail climbs steeply again, when looking back I have a deja vue, it looks almost as yesterday afternoon. A small river runs at the bottom of the valley which is covered by yellow grass. The little waterfall from yesterday is missing, otherwise it is an exact copy. One of our porters is sick, luckily we have met a local from Shey yesterday who agreed to guide us and carries the porter’s load. Dawa was here 5 years ago and since there are no trails it would have been difficult for him finding the quickest way to the pass in this weather. The guide is nicknamed ‘Lama Guide’, because he is the assistant of the Shey lama. He literally runs up the hill with his 20 kg load, nobody has the slightest chance of keeping up with him. Every few minutes he turns around to make sure he is not too far ahead, but nevertheless he has to wait more than 15 minutes near the windy top. He only wears a thin chuba and does not even button up his shirt. It is still snowing. The ‘normal’ route to Shey goes over Nang La, but the guide knows a better way and we continue westwards towards Mendok Thing La. This pass is also above 5’000 m high but much faster to reach from where we camped. To protect the face from the cold I keep my head down, thus also becoming more familiar with the details of Himalayan flora. Suddenly all those little flowers, lichen and moss becomes highly captivating. We get to the ridge fast, and after fixing the broken prayerflag there is not much else to do – snow, clouds and wind do not make this a place where you want to spend much time – so we head down on the other side. The regular path follows the mountain flank, but most of us choose the shortcut down a steep black gravel slope. It consists of very small slate pieces and the boots sink in comfortably - running down taking big jumps is a lot of fun and also much faster. Everybody stops at the first maniwall where Lama Guide points to one of the ridges. A large boulder resembles a person’s head. It is the place of a local goddess, the lama’s assistant tells stories of miraculous births, and mentions that it even worked for a child-less American couple who came here twice just for that. The liaison officer wraps fist-sized stone in a kata and adds it to the wall in hope of getting a son. They have three girls already but a son is important in Hindu culture. After descending on slippery stones near the river we climb up the valley’s right wall until we reach the ridge and hold right to cross another small valley and another creek. There we have to walk up again where the trail seems to disappear. This route is for definitely for locals only, nobody else would ever find it. I have to use both my hands to climb across some bigger rocks. It is slippery and falling would not be pleasant since it is rather steep. We all walk without taking breaks. Far down in the gorge are patches of green, it is a pity that low clouds make it impossible to get a better view. We stop only once on a small plateau near a sharp turn. People who passed by have erected dozens of small stone piles resembling houses. We might be walking the last part of the kora around Crystal Mountain, a few places were mentioned in books I read. The more religious people in our group take their time to add another careful construction. This is the house in which you live after a bad reincarnation, as a precaution I also build one though it is not nearly as fancy as the others are. The intensity of snowfall has been varied since we left the pass two hours ago. Now that the deep valleys are behind us it is clearing up. The remaining mist is blown from the valley floor towards the pass and burns off on the way, opening the view over a wide green valley with a handful of red buildings. 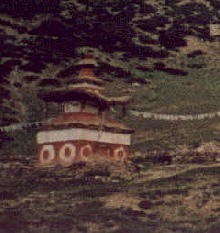 This is the famous Shey gompa. The monastery lies amidst gentle hills, and except for a snow-covered mountain range at the horizon there are only few high mountains, most of them are grouped together in little massifs. The large herd of yaks makes the scenery even more picturesque. This is our first glimpse of the so-called characteristic Dolpo landscape. Although the term is mentioned in many books and articles, it seems to be just a tourist simplification and not an accurate description of the landscape which is much more diverse. The weather has improved and the end of today’s walking is in sight. A flock of roughly 40 mountain sheep graze on the mountain to our right, but they spot us before we see them and walk slowly further up. It is mentioned in old biographies that the lamas of Dolpo have always tried to convince the villagers not to hunt, which was not an easy task. The Shey lamas must have been quite adamant, the rare blue mountain sheep can be found in large numbers here. The zoologist Peter Schaller did some research here thirty years ago. He was accompanied by Peter Matthiessen who wrote the rather overrated book ‘Snow Leopard’, which undeservedly became a best-seller while Schaller never quite received the attention he deserved. I suddenly spot a monastery on a ledge in a steep red cliff to our left. Dawa doubts that somebody is there, which is not encouraging. I am almost convinced to go to Shey directly when Thomas spots a small figure on the monastery’s roof. This part of Dolpo is sparsely inhabited and not as rich in cultural highlights as other areas, so it is wise to use every opportunity. 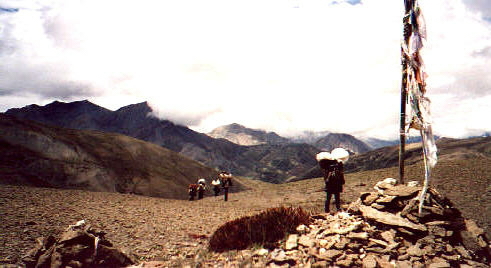 The group splits, the porters and the officer head directly to Shey while we follow Lama Guide. 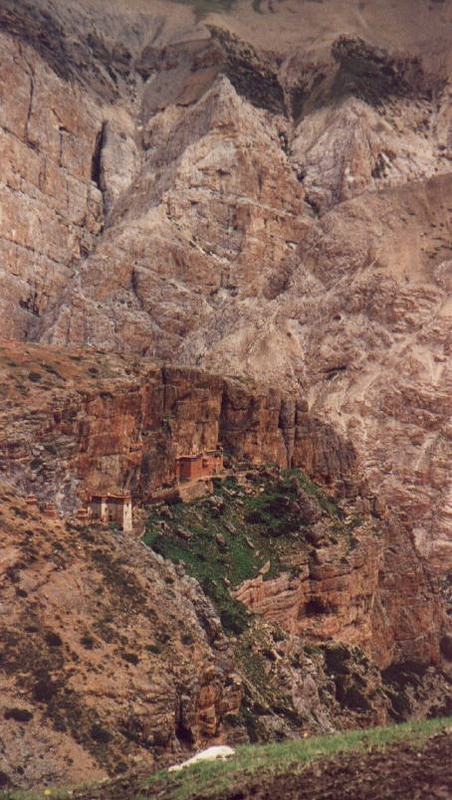 The monastery is built on a sheer rock cliff. The small ledge in the reddish cliff is a few metres wide and the three houses seem to cling to wall. Only the red main building seems inhabited, a young boy in a monk’s robe peaks curiously out of the balcony. A dog is barking furiously when we approach the monastery, as a precaution I grab two big rocks, but am relieved to see that the dog is chained. Another one is barking from further away but also proves harmless thanks to a rope around its neck. We are told to wait a few minutes and then allowed to enter. I cannot see a thing in the darkness, after a few seconds the eyes get used to it and I climb up a steep stair to a narrow corridor. I find myself in a very tastefully decorated room, and am even more surprised to face he same young boy sitting in a dignified position on the lama’s throne. This has all come very unexpectedly. I have never been in such a situation before and despite the fact that I know a thing or two about local customs and religion I seem destined to make a horrible faux pas. Slowly I walk towards the boy, folding my hands, bowing and stammering a (hopefully) solemn sounding ‘tashi deleg’. I cannot have been completely wrong, the young lama smiles and touches my head to give me a blessing. An older monk whom I have not noticed so far shows me to sit down on one of the nice carpets near the balcony. I relax and have time to study the room in more detail. It is about 4 x 4 meters wide, the small entrance is near the window, on the opposite wall is a rack of Tibetan books. Colourful paintings and Thangkas decorate the walls, wooden red pillars go up the ceiling. He is the 17th incarnation of the Shey and Tsakhang lama, his predecessor died nine years ago. Two years ago this child was found in Phijor, a village three days north from here. At his birth auspicious rainbows could be seen and he was treated like a lama by the other children. A few other candidates were also found, the Karmapa at Tsurphu monastery identified this boy as the reincarnation. He is leaving for Kathmandu tomorrow to be educated in Pullahari Monastery. After completing his studies, he is supposed to return to Shey. This is very hard to imagine. In Kathmandu you find all the luxuries of modern life, deciding to come back here and lead a lonely and hard life takes a lot of conviction and compassion. The boy’s father goes with him, the mother – who was not happy about her son being chosen as a reincarnation - stays in Phijor where she works as a farmer. Finding the old tulku’s predecessor proved quite difficult. When the 15th Tulku died in the 1920 after smallpox, the head of the Kagyupa sect gave some hints about the place of the reincarnation. The written instructions were quite clear and included a description of the house, number of family members and even their names. But it fitted too many candidates, and after a few years of unsuccessful searching the search committees returned to Lhasa to ask the Karmapa for more information. He did not know more and sent them off again. Eventually they found the family near Manang, a village north of the Annapurna. But the father denied having a son because he did not want him to go away. Important people in Dolpo and Upper Mustang tried for two years to convince the father to let his son go and succeeded. The young 16th Tulku was not very virtuous and left Shey after an argument. He went to Tibet to continue his studies there. After returning to Dolpo he was more serious, and went into solitary meditation for a few years. People brought him food which he picked up during the night. Many were afraid he died when they saw nothing of him for three months. After nine years of solitude he received many local people who asked for his advice. When he died at the high age of 73, he was preserved in salt, a common practice for high lamas. Back to the present. The old monk who stays with the young Tulku came from Darjeeling to take care of the boy. He speaks little English but the complicated translation (Tibetan to Nepali to English) works good enough. The monastery is called Tsakhang, tsa (or tah) meaning ‘red’, khang is the word for ‘house’ or ‘building’, because of its location in the red cliff. It belongs to the Kagyupa sect, famous for its scholars Tilopa, Marpa and Milarepa. The most widespread sect in Tibet is the Gelugpa, also called ‘yellow hat’. Founded by Tsongkhapa they have stricter rules regarding marriage, alcohol etc. than the older ‘red hat’ sects. 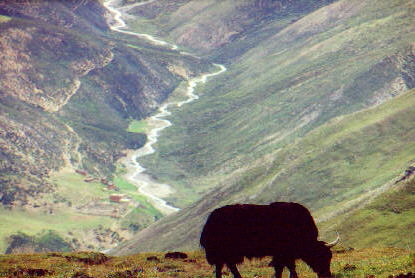 Gelugpa gained political influence all over Tibet but never got to the remote and relatively uninhabited areas. I suppose it would not have been successful here anyway, not because of philosophical reasons (I am in no way qualified to say that) but simply because it is not very practical. The villages here are not big enough to support a community of monks. The monks and lamas also have to work and if you do work on the field like normal people why should you not get married and enjoy the things normal people also enjoy? Most monasteries in Dolpo are either Bon or Kagyupa, although there seems to be a trend to convert to Nyingmapa, the oldest sect founded by Guru Rimpoche. There are some Sakya monasteries, but unlike in Mustang the tradition is not practised anymore. I am quite surprised how similar yet different these two areas are, situated next to each other they are separated by only one mountain range but the people have distinct faces – especially the women – and also culturally it seems to be quite varying. It seems that the Dolpopa have more connections to their neighbours in the north and south, where the old trading places are. We leave the monastery in high spirits, such coincidental encounters are a great change in a normal walking day. Having received blessed strings and the lama’s blessings also convinced Dawa and Khami of our detour – they were not very eager to go but now they are also happy. The small gorge joins a larger one further down which leads to Samling, Phijor and the Tibetan border. It becomes wider in the opposite direction, eventually turning into a green plain where two rivers meet, on a little plateau stands Shey gompa. It is surrounded by half a dozen red-coloured buildings, three houses are built high above the valley and two small stone huts stand on the grassy plain near the river. 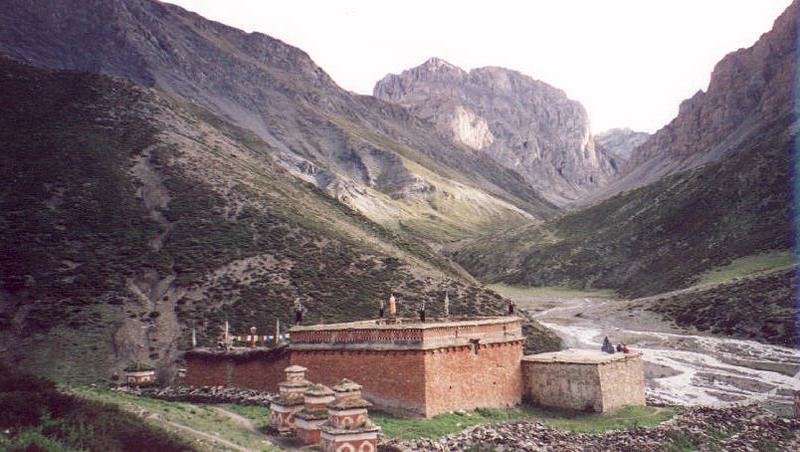 This might well be the best-known place of such small size in the world: Shey gompa. We decide to camp near the huts of the yak-herdsmen. All the yaks are further up, only cows are grazing down here. They do not give much more milk than yaks, are less robust and cannot carry loads and are mainly kept for crossbreeding with yaks. After some rest we visit the 650-years old gompa. The maniwalls are so long that they have to take many, many curves in order to fit in the complex, thus looking like a labyrinth. The quality of the carvings varies greatly, some features nice Taras, others contain long texts in small letters, but the majority is much simpler. After walking clockwise around the whole gompa we reach the assembly hall which does not look very inviting. An ugly wooden fence locks the front porch, the caretaker lives in the adjacent building and shows us in the main room. He is a friendly but not very learned layman and cannot answer many questions. The walls were painted recently, some figures in good quality and detail, while the colour of others is much too bright and the compositions are not in proportion. It was done by a local artist but when and by whom nobody can tell. A number of artefacts and musical instruments are standing around but do not seem to be used regularly. I assume that in the years between the old lama’s death and the finding of the young boy the monastery was not called upon very often. The people do not support their monastery as they should, complained the monk from Darjeeling. I am a little disappointed, I have expected more from the famous gompa. Sure, its location is superb, but the monastery itself seems without life. I might be wrong and it is simply because people are busy in the summer months, away on trade or on the pastures with their cattle. The monastery might come to life during the festivals. The largest gathering takes place around July when villagers from all over Dolpo come to Shey. They meet for a pilgrimage around ‘their Mount Kailash’ - Crystal Mountain. When you do the kora more than a dozen times you can see Mount Kailash from one of the passes. The annual festival lasts for several days and is not only a religious matter. There is time for sharing news and doing business, drinking, dancing and singing. Three distinguished looking men with nice horses come out of the courtyard of a nearby building. With my little knowledge of Tibetan I find out that they are on the way to Tsakhang to pick up the young Tulku and bring him to Juphal. The porters stay in the caretaker’s house and enjoy the sunny weather on the roof. The views from up here are quite nice. Climbing down is not easy, thick smoke comes from the kitchen below and trying to find the steps of the steep and narrow trunk in the dark is already difficult enough. The second floor is one single big room which serves as a storeroom and kitchen. An open fire burns in a corner, the twigs produce a smell like incense, the smoke burns in the eyes. Sitting down makes it endurable since all smoke goes up through the hole in the roof. A large pan is put over the flames, two women are busy roasting something. My question about the content of the big bags is answered by giving me a handful of warm barleycorns. They are roasted first because otherwise the grain would steep. It has not been ground into tsampa yet and taste delicious, this would be a tasty snack for on the way. The grains are thrown in the pan together with black sand, the cracking noise sounds very familiar and after sieving the sand out we are offered Tibetan popcorn. The locals seem to enjoy our company, tourists who speak Tibetan do not sit in their kitchen everyday. They are very hospitable and offer everything from butter tea and sweet tea to Chang and rakshi. But since health is more important than politeness, I usually decline. It is easy to refuse here without offending anyone, and I have already taken my chance today when I drank butter tea at Tsakhang. You are expected to finish the first cup and when it is refilled drink the second and third one. But this rule does not apply to tourists, sipping only a half a cup seems acceptable. Maybe I am too paranoid, but it is better to be careful than sorry. After this very interesting excursion to local cuisine we enjoy one of Padam’s own creations for dinner: We call it Padamosa, an odd mix of pasta and salad in a samosa, which tastes excellent. I would love to hike up the narrow gorge towards Samling, but our route is different and we follow the eastern valley. In the next two days we will walk southeastwards close to a ridge, afterwards we will enter the Tarap valley to Do. Shey gompa soon disappears behind a curve, a small path branches off to the left, after a day one would reach Saldang. Dawa decided to take the direct route to Do and we continue to walk in the black gravel of the riverbed for another hour. After a sharp right turn it becomes steeper, at the last flat spot we stop for lunch, although it is still early. This will be the last waterplace for the next few hours, and without a good meal climbing would be difficult for us, and probably even harder for the porters who do not eat as much breakfast as we do. After eating huge portions of rice and some yellow dal they start with the ascent. While we are having lunch the thick clouds disperse and to the north we see the typical round and barren hills. Due to summer rains some are covered with a little green, therefore it does not appear completely desolate. Until now we have mainly walked in valleys, for the next two days we will be at higher altitude while walking along a ridge and get completely different views. We leave in hope to reach the top in time to enjoy the blue sky. With a stomach full of dal baht it is easy to go fast, after half an hour we reach the colourfall prayerflag which marks Sela Munchung La, 5’063 m high. We sit rest under the fluttering prayerflag and enjoy this perfect moment: White clouds drift on the dark blue sky. The huge variety of mountains in different colours and shapes is magnificent, only two slightly higher mountains to the south are hidden in clouds. It looks as barren and hostile as you can imagine. What a contrast to the side we have just come from with its inhabitable valleys, vegetation, and mountains that were grouped together in small massifs that stood out of the landscape. This side is just mountain after mountain, hundreds of peaks and ridges that look like waves in an endless ocean. The trail slowly descends and I expect an easy walk, but instead we have to cross numerous side valleys. Surprisingly the officer has been able to keep up (more or less), but now he literally crawls across some steep but not dangerous slopes. Maybe he is afraid of heights or feeling dizzy. We cross one side valley after the other, this is a neverending afternoon. I start to feel the effects of walking at high altitude and develop a slight headache. I felt comfortable at Shey and have never had any altitude problems before so I do not worry, but the lack of energy is annoying. This trail must be a nightmare after strong rain and would slow us down immensely, luckily a strong wind blows all the heavy clouds over the ridge and towards Mustang. No camping place is in sight therefore we stop at the last remotely suitable spot before the pass: we find some space for our tents and a rivulet far down that carries a little water. It is late afternoon already and this must have been a tiring day for the porters, too. We set up the tents quickly, hoping that the strong wind won’t blow them away. I am a little worried about the big tents of the porters and the kitchen crew, our small tent should be fine. The officer’s tent was certainly very nice in earlier times, but now it offers little protection against rain and the extra plastic sheet is of little use. The sun goes down behind the ridge soon, making this the coldest evening so far. I crawl in my sleeping bag early since I feel a bit stomach sick. I miss the most delicious dinner so far, momos filled a great mix of vegetables. It is really difficult to skip the fantastic food, luckily Padam has more of the exactly same ingredients and promised to make the same momos again when I feel better. I do not sleep perfectly well, but I guess this is normal when spending the night above 4’500 metres with the wind trying to tear your tent apart. My stomach feels fine again, and the hot noodle soup and omelette gives me back some of the energy I missed from skipping yesterday’s dinner. The sunrise is striking though not as you usually imagine it with golden sunrays on a dark blue sky. Dark, windswept clouds are floating above the mountain ranges, the sun breaks through and hangs as a light grey circle in the sky. Isolated big rays illuminate the scenery in a grey and ochre light. It is a most impressive demonstration of nature’s raw power, a sight which will stick in my mind for awhile. One last sidevalley needs to be crossed and then we stand near the foot of Langmosia She, a black slope giving way to high mountains with glaciers on their top. It’s too bad the fog does not let us see the scenery more clearly. After a steep climb I hope to see the prayerflag, but it is another half-hour of strenuous. The achievement of the porters is immense, but I am almost more impressed by Pradip Kharel, our liaison officer. He certainly is not used to hiking, his boots look brand new, his equipment is not very fancy, but he crossed all the passes and never complained. This pass must the highest point so far, according to the map the peak to the left is over 6’000 m and it looks very, very close. It seems so near that is immensely tempting to climb it, and I don’t even remember why we decided not to. The peak opposite seems even higher but is covered in clouds, so are all the mountains in the south. On the horizon to the north we see the range we have crossed yesterday. We descend quickly, maybe too quickly. Dawa told us that we would have a rest day in Do tomorrow and that there is only one pass to cross today. This is impossible according to my map but he knows the area and maybe there is a ‘secret way’. Instead of heading straight to Numa La north, we follow the river down the valley. The path over muddy meadow is very slippery, and the many boulders just call for sprained ankles. When we arrive above a deep gorge a familiar turquoise colour at its end indicates that we have completed the circle to Upper Dolpo and are (relatively) near Phoksumdo lake again. It also shows that instead of taking the straight way to the Tarap valley we have walked around the whole mountain range and have to cross another pass to get to Do. The main path slowly descends in the flanks of the opposite mountains, a thin yellow line chiselled in the greenish rocks. After crossing more mudholes we reach the path where walking becomes easier and even enjoyable. Half an hour later we reach a crossing and take a small path up a valley. We have now joined the way from Ringmo to Do and camp at the first possible spot near the creek. Summary Part 3: We have to cross the first high pass in fog and snow before finally reaching Inner Dolpo. 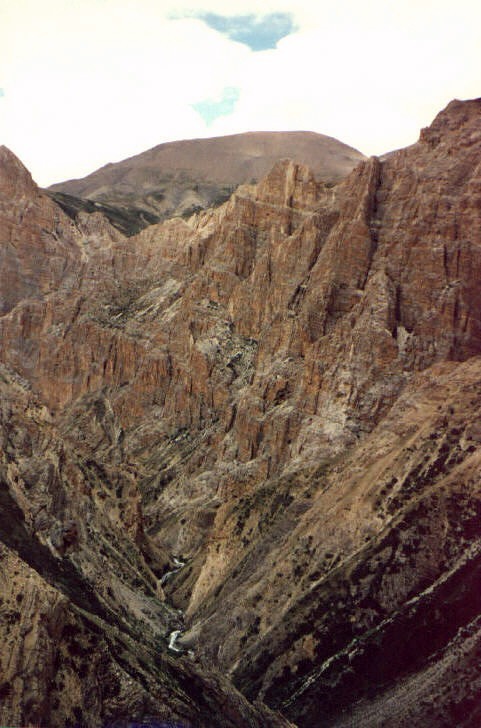 A narrow trail leads to a meadow high above a valley where two small rivers meet. Down in the plain are a few red dots, the buildings of Shey gompa! On the way down we see a monastery clinging to red cliff, Tsakhang gompa. We meet a young tulku there, after an interesting break we reach Shey. 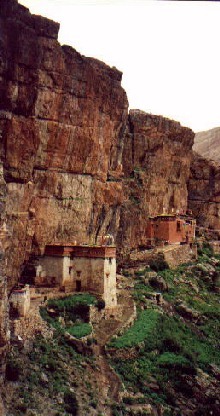 The monastery and adjacent buildings lie on a small hill above the confluence of two small rivers, a great site. We turn south again and cross three more passes above 5'000 metres on our way to Do Tarap. The scenery to the east is completely barren and without life, an ocean of hills and mountains as far as the eye can see. It is hard to imagine that we will cross that area in the next two weeks. But first we will spend three days in the lovely Tarap valley, which we will reach after crossing Numa La.